Develop Property-Showcase website with description, multiple photos, slideshow, showing dates, neighborhood information, loan calculator, etc. Subsequent to offer acceptance, marketing campaign shall continue until all contingencies of sale have been removed. Your priorities, preferences, requirements & timeline for selling your home: how I can be of most help and service to you. My qualifications and resources to achieve your goals. Our marketing plan to comprehensively reach every potential buyer, and every broker who might have a buyer—wherever they might be located. Options for preparing your property to show in its best possible light. Current market conditions and the comparative market analysis—to price your home so as to maximize market response and final sales price. 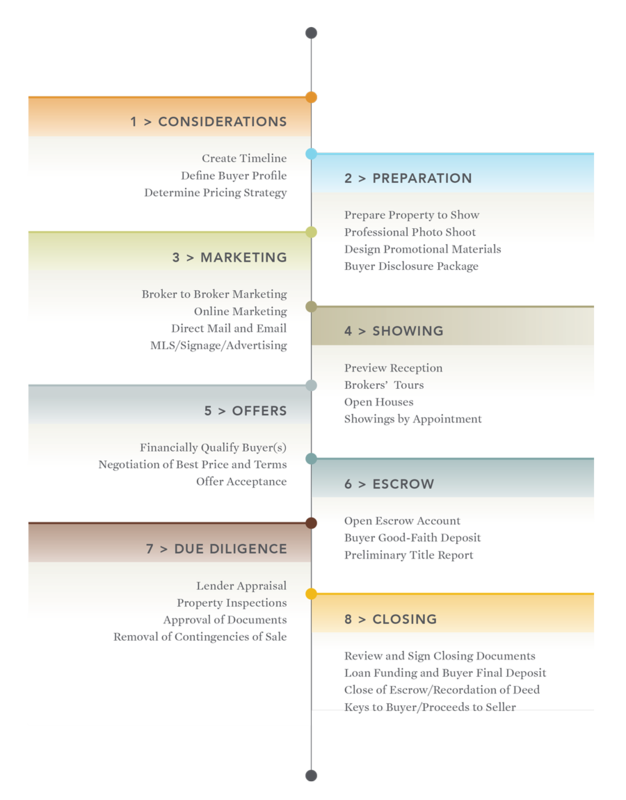 An overview of how the entire listing, sales & escrow process will work. Typical costs of sale and a calculation of your estimated proceeds. The state agency disclosure & the standard listing contract. Is there anything else you’d like to cover? As your agent and fiduciary representative, I will always serve and protect your interests above all others to the very best of my ability. I have a proven expertise to prepare my clients’ properties to show in their best possible light and generate the highest market response—in order to attain the highest achievable sales price. I implement a marketing plan of the highest quality and effectiveness in order to seize the attention and maximize the response of the buyer and broker communities. I will rigorously qualify prospective buyers. I will expertly and aggressively negotiate the purchase contract on your behalf in order to maximize your proceeds of sale. I will coordinate and manage every aspect of the sale transaction to minimize unpleasant surprises, delays in close of escrow, buyer attempts to renegotiate, and any and all future liability once the escrow is closed. In everything I do, I shall work to minimize your stress, time and effort during the listing and sale processes, and bring everything to a successful conclusion. I have superb client references. Our job is to look out for your best interests. First we listen. Then we develop a strategic plan to achieve your individual goals. Their home is usually one of my clients’ biggest financial assets. Its sale is typically one of the largest, most complicated and most emotional financial transactions of their lives. I take that responsibility very seriously. As your agent, I have a fiduciary responsibility to protect your interests to the best of my ability. To achieve the best attainable sales price and terms within the timeframe you delineate. To make the process as easy and straightforward as possible, with a minimum of time, effort and stress on your part. To protect you, as best I can, from any and all future liability. I don’t get paid until the sale of your home closes for a price you deem acceptable. 80% of home buyers in the United States now begin their search on the Internet. 25% buy a home they first see on the Internet. All listings feature photography by a professional real estate photographer. The slideshow allows buyers to walk through the home from anywhere in the world. Consumers are now more than 1000% more likely to find the home they purchase on the Internet than in a newspaper or magazine. The quality of the agent working on your behalf—his or her competence, integrity, work ethic and commitment to your interests—can make an enormous difference in the outcome of your home purchase or sale in money, stress, time, in future happiness. The basic truth: the vast majority of serious buyers and their agents simply will not make offers on properties they consider significantly overpriced. Overpricing wastes the optimum moment of Buyer/Broker interest in the property—when it’s brand new on the market and the marketing plan is in full implementation. Killing the “sense of urgency” in buyers’ minds that they must act quickly with a strong, clean offer. It is this sense of urgency that typically leads to the highest sales price—either through a competitive-bidding multiple-offer situation, or the perceived threat of the seller receiving other offers. Dramatically reducing the perceived value of the property because buyers assume there must be something wrong with the property. Just as competitive offers enhance value in buyers’ minds, an apparent lack of interest deeply reduces value. Overpricing helps sell competitive properties—as they stand out as a good value in comparison. Overpricing usually results with the property selling for less money than if the property had been properly priced to begin with. In order to win the listing, some agents suggest a list price considerably higher than market conditions and comparable sales justify—because these agents believe this is what the seller wants to hear. Because of the factors mentioned above, this is a huge disservice to their clients. My practice is based upon telling my clients the truth.